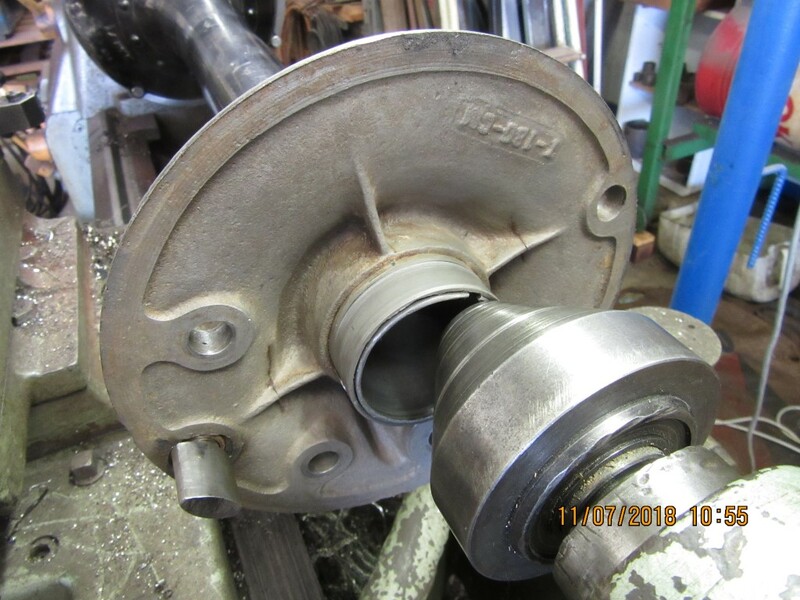 The MTFCA manuals mentioned above are great for getting to know what you need to know and do repairing the different aspects of a T.
Your description about your rear axle sounds likes you need to need to tare it down and rebuild it. The rear axle manual will help you do that. As the old saying goes when in doubt read the instructions. You may already have the Model T Ford Srevice Manual. But if you don't that's the one every T owner should have. Mtfca manual and dvd helped me. I would have a good guess that the babbitt spacers are junk. The thrust washers are less than 1/2" thick in total. Either there is something else going on, our your estimation of 1" play is well off. In any case, a tear down is warranted. Someone loaned me the rear axle video and it is very good to be able to see and hear the info as well. 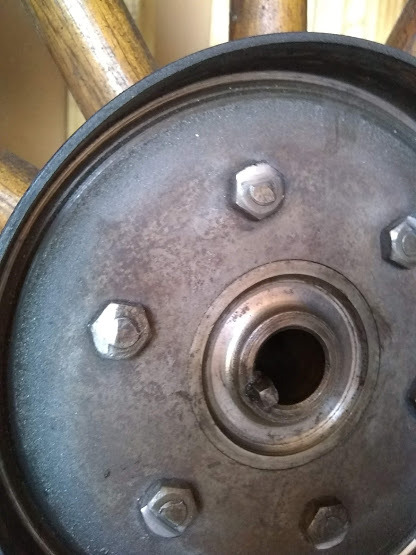 Classic symptoms of rear axle thrust washer failure and its results. Been there, done that. Follow the book and you will be fine. My one quibble is that Glen is impartial about what to use for a pinion bearing. I'll go with the Fun Projects bearing every time. Show us the teeth of the ring and pinion. Ought to be pretty sharp ends on the teeth by now. Hello Steve Jelf, interested in the height of the jack stands you use when removing the rear axle from body. Thank you John P.
27". The square tubing is 2", so the frame is 29" off the floor. Plenty of room to work. Nick, you're going to want to pull the drive shaft as well and rebuild it. 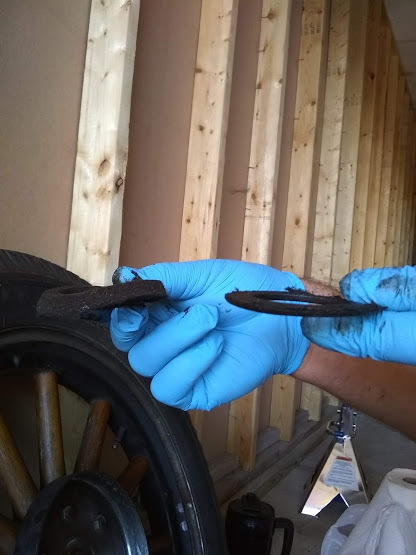 Replace the axle, drive shaft and radius rods as a unit. As Mark points out, if there's a lot of gear wear the pinion will also need replacing. 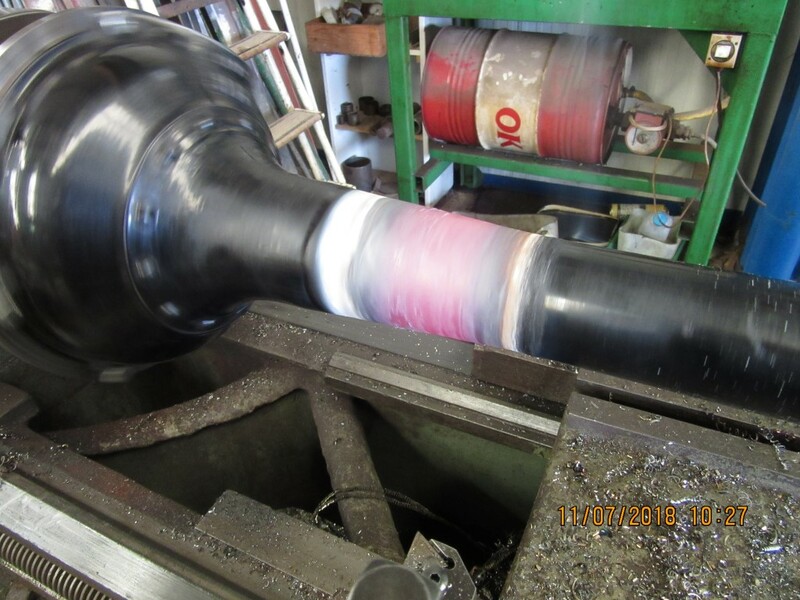 Nick : Also look or your Axle Housings are bend !!! Here are some pictures of the ring gear. 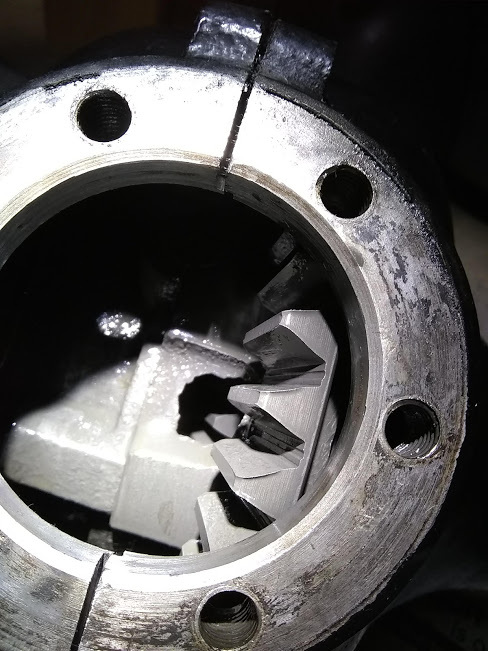 I currently don't have any photos of the pinion gear, but from what I can see on the ring gear, the teeth look to be in fairly good condition. 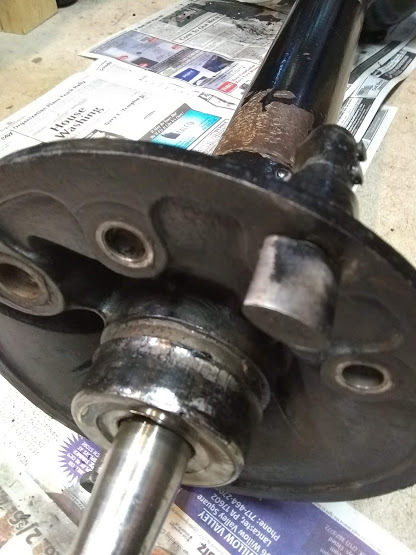 Do you think the drive shaft should still be rebuilt? Sounds to me like your axles are loose in the gears as well as the thrust washers being toast. 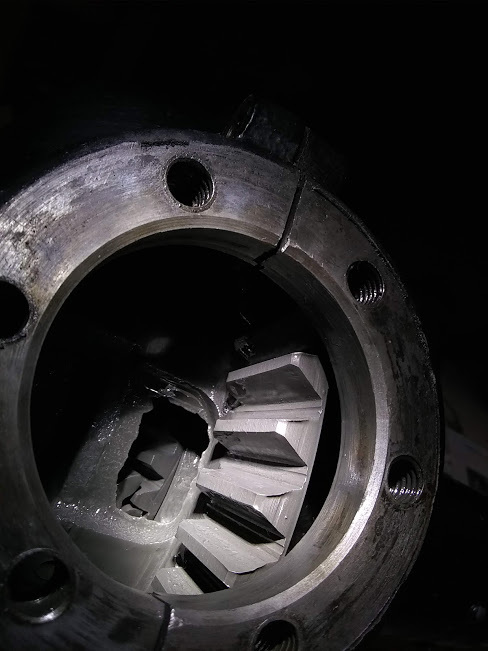 It is not uncommon for the gears on the end of the axles to work loose. When that happens the set of axles can slide side to side and instead of the center carrier holding it all in place, the axles move until the wheel contacts the inside of the backing plate. Ooops.....sorry about the double post. BTW, you are about two minutes away from having the housings separated. 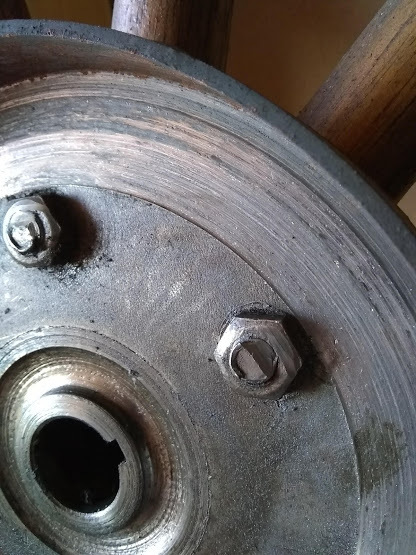 There are only 7 5/16 bolts and nuts. Your carrier probably is the early style with 3 bolts and nuts. Takes just a couple minutes to put it apart. 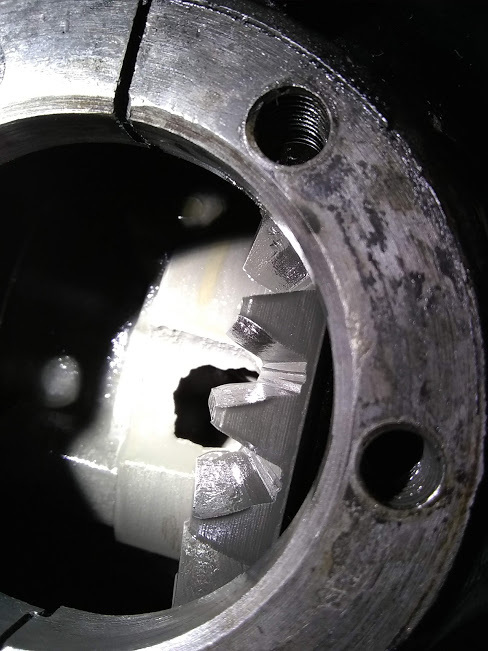 Most likely, you'll find a number of details "wrong" or worn out when you tear down the axle, and the amount of side play you noted probably has done ugly things to your drive shaft bearings and U-joint. From what I can see of your ring gear, I wouldn't run it, but that's me. I'd be amazed if the pinion isn't as bad or worse. 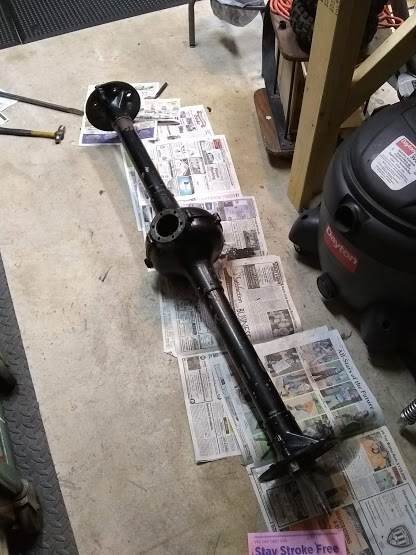 Given the expense and effort required to get into the rear axle, you'd be well paid to rebuild the complete unit, axle and drive shaft while you're at it. Nick, T's usually wear the ring gear more drastically than the pinion for some reason, and to me, that looks to be pretty worn out. I personally would try to find a better used one, or if you can afford it, get a new one. I always think the best advice when dealing with the rear-end/driveshaft is to pull it all apart and rebuild it when in doubt and save yourself some headaches and safety issues in the future. Just my opinion of course. BTW where is the oil inside the diff, everything looks totally dry in your pics? I agree, spend the few minutes it takes to tear it all down. Then follow the book putting it back together, replacing parts where needed. The bad news is that the second picture of the ring gear looks pretty bad. The good news is that the spider and differential gears are usually OK.
Nick, as others have said, consider the drive line as part of the overall rebuild. Take the time to look over everything and replace every part that is of concern. Once rebuilt and set up properly you'll never have to worry about it again. 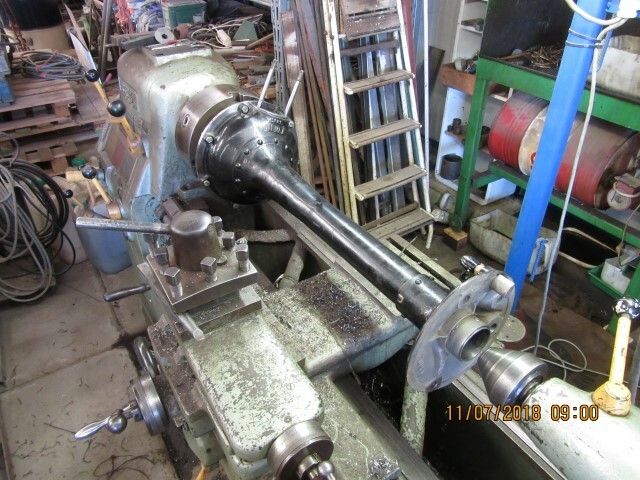 I rebuilt mine two years ago and unfortunately all I could salvage were the axle and driveshaft housings. The good thing is, it can all be rebuilt. There are a number of members here that may be able to supply you with some good usable parts, as was the case with me. 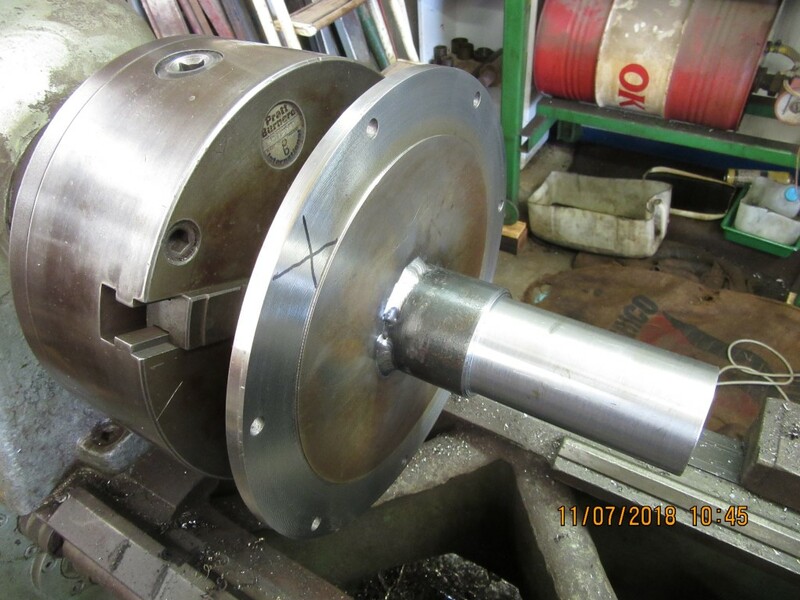 The new drive-shafts and axles are properly made and fit well, the same with the Ring and Pinion gears. The Fun Projects Pinion setup is really nice. Just my experience with the direction I chose. Of course the choice is yours which way you want to go. Please keep us posted. Nick, this thread is a complete disassembly and rebuild of the diff and drive shaft. If you complete it, welcome to the club!